This antibody is expected to recognise both reported isoforms (NP_057167.2 and NP_149421.1). WB: Rat brain tissue lysate. Our Abpromise guarantee covers the use of ab40860 in the following tested applications. WB Use a concentration of 0.1 - 0.3 µg/ml. Detects a band of approximately 65 kDa (predicted molecular weight: 53 kDa). 65kDa band detected in rat brain lysate.The observed molecular weight corresponds to earlier findings in literature with different antibodies (Porcella et al, Eur J Neurosci. 2000 Mar;12(3):1123-7. PMID: 10762343). Publishing research using ab40860? Please let us know so that we can cite the reference in this datasheet. Cell harvesting/tissue preparation method: cells were detached by accutase (PAA), spun and fixed in 4 % formalin for 20 min. Then, cells were spun and resuspended in 100 µl BD Perm/Wash solution containing 0,5 µg CB1 (ab40860). This was then incubated for 30 min at 4 degrees. Samples were washed with 1ml of BD Perm/Wash buffer and spun again. 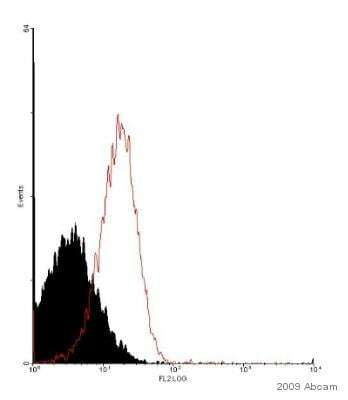 Then 100 µl of BD Perm/wash were added including 1 µl secondary antibody (donkey anti goat, Santa Cruz Biotech). This was again incubated at 4 degrees for 30 min. After another wash step, cells were resuspended in 4 % Formalin in PBS and analyzed.